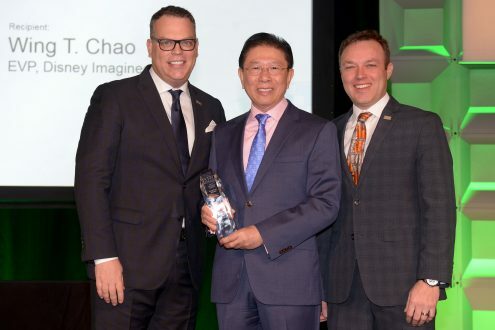 Los Angeles (February 1, 2018): The International Society of Hospitality Consultants (ISHC), presented Wing T. Chao with the 2018 ISHC Pioneer Award at the Americas Lodging Investment Summit (ALIS), the largest hotel investment conference in the world. Upon receiving the award, Chao remarked, “I am profoundly honored and deeply humbled to receive this prestigious award. In honoring me, in essence you are also honoring many other people.” Chao went on to acknowledge and thank Disney leaders, colleagues and designers he worked with and his mother and father who inspired him to be an architect. The ISHC Pioneer Award was established in 1996 to recognize one individual each year who has made an outstanding contribution, achievement and/or improvement in the hospitality industry. Past recipients include J.W. Marriott, Barry Sternlicht, Jonathan Tisch, Bill Kimpton, Kathleen Taylor, Ian Schrager and many other notable industry leaders. Winners are selected on a basis of three criteria: Active involvement in the hospitality industry; Contribution to the industry; and Personal/organizational attributes and qualities adhering to professional standards recognized and respected by industry peers. Chao is an internationally renowned master planner, architect and developer. He is greatly admired and highly respected in both the hospitality industry and the design & architecture communities. Chao began his career at Disney in 1972 and went on to become Vice Chairman of Development for Walt Disney Parks & Resorts, Asia Pacific. He was also Executive Vice President for Master Planning, Architecture & Design at Walt Disney Imagineering. During the course of his 37-year career at Disney, Chao oversaw the master planning, design and development of its worldwide businesses worth over $12 billion. He directed development teams consisting of Disney Imagineers and the world’s leading architects and designers on projects including Disney theme parks, 100,000 new and renovated resort hotel rooms, 200 restaurants, 4 million-square-feet of retail space, 3 million-square-feet of entertainment venues, 4 million-square-feet of office buildings, 2 million-square-feet of mixed-used development and numerous convention and exhibition centers at Walt Disney Company’s resorts in California, Florida, Hawaii, Tokyo, Paris and Hong Kong. Chao also directed the design for the four Disney cruise ships. Chao remains actively involved in the hospitality industry and he has been working on numerous multibillion-dollar integrated resorts, theme parks, hotels, water parks, retail, entertainment, commercial, convention and exhibition projects. Produced by Northstar Travel Group in association with the American Hotel & Lodging Association (AHLA) and Burba Hotel Network (BHN), the two-and-a-half-day ALIS event features an extensive array of seminars and panels hosted by leading experts and investors discussing important trends and identifying new opportunities. The conference attracts the lodging industry’s leading hotel executives, investors, lenders, developers and professional advisory community. Proceeds benefit the educational, research, and training missions of the Educational Institute (EI) of the American Hotel & Lodging Education Foundation (AH&LEF), AH&LA’s not-for-profit affiliate. ALIS 2018 took place January 22-24, 2018 at the JW Marriott and Microsoft Theater L.A. LIVE. Visit the ALIS website, www.ALISconference.com, for additional information.